This was me (left picture) before I developed the 7 Day Jump Start. I didn’t get into “fitness” and “nutrition” at all until I was 39. Ten years ago, I was a divorced single mom, overweight, broke, in debt and had lost my house. I JUST had a baby, YES BUT she weighed 6 lbs. That was it. The additional 54 lbs I gained was from french fries and McDonald’s sundaes. And MONTHS after she was born I was STILL overweight AND depressed. My confidence was totally gone! I searched for a way to fix it all and I was met with INFORMATION OVERLOAD. Ugh! It was SO confusing and all I found was complicated conflicting methods! I decided I was going to search for a simple, easy to follow method. I studied, I researched, I practiced on my friends and myself! I became a Licensed Master Sports Nutritionist, I became a certified Personal Trainer and learned everything I could! The RESULTS happened quickly and effortlessly and then the 7 day jump start was born! A decade later, I am 47 and work with women who feel there is more for their life and purpose, health and confidence. I graced the covers of ELEVEN magazines and recognized worldwide as a LEADING Health and Fitness expert by Greatist, FORBES, Health, Muscle & Fitness, Woman’s World, and many more! I became a master at creating a vision, shifting my mindset and learning to create all possibilities from NOTHING. I thrive on helping others change their past stories and patterns to shift their beliefs and results now too! It is your turn! YOU ARE NEXT! You are 7 days away to results! Dieting shouldn’t be this hard. You see other women rocking consistently fit, strong bodies and wonder what are they doing differently than ME? No, there isn’t. And listen, it’s not your fault. There is a diet epidemic where there’s so much confusing information out there and no clear, simple path to follow that works LONG TERM. This is just WRONG. If you believe in these fundamentals like I do, read on to learn how I can help you. I’ve been in your shoes and like you, have firm beliefs about how nutrition SHOULD be if I want long term results. Over the last 10 years I figured out the BLUEPRINT and distilled it down to 7 DAYS for you to breakthrough to the body and nutrition lifestyle that you’ve been looking for. The 7 Day Jump Start original PLAN is a simple to follow 7 day formula that gets the body in FAT BURNING mode, helps LOSE the bloat, and STOPS the cravings. This is not a workout plan but rather a complete 7 Day Jump Start nutrition program to Jump Start weight loss. This plan will work with any fitness level. The program is simple, based on REAL food, requires minimal cooking, and is naturally gluten free, soy free and peanut free. There are NO supplements required on this plan. How do I start? It is simple! Just click here and download the original 7 day jump start plan and get INSTANT access to the simple formula that has helped so many get radical results. Do it today and I’ll include TWO bonuses to help generate the quickest results. As a bonus, I’ll throw in my “Stay Lean Recipes Book“ with an additional 43 easy to prepare and gluten-free recipes FREE – Plus you will get 46 do-anywhere printable workout cards! These are ALL linked to a video so you can see detailed workout instructions. Free Access to NJFit Squad community where ALL of your questions are answered! 7 Days with me Video series! I am delivered DIRECTLY to your inbox daily for 7 days to make sure you are are motivated and on point every day! DONT FORGET TO CHECK OUT THE AMAZING BUNDLE OFFER BELOW! 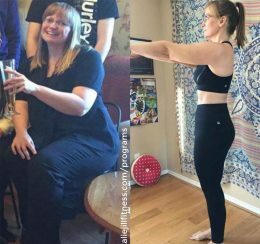 Nicole, one of my most heartfelt transformation success stories, was holding onto and what she let go of to lose and keep off the 40 extra pounds she was painfully carrying. What I’m proud of is the ripple effect my clients like Nicole experience. The ripple effect is what you’ll hear us talk about in our no holding back, questions answered girl talk. Hit play! Soooo proud to say that I no longer need to wear curvy jeans!! I started with Natalie Jill at a size 16 and am now wearing an 8. For most of my life I did not have to worry about my weight. I was active and thin. After suffering a back injury, my workouts stopped and I slowly began gaining weight. I am 50 and want to be active, travel and have fun!! I knew that was hard to do if I was feeling unhealthy and overweight. I am changed inside & out. I not only lost twice as much weight as I set out to lose, but I gained a new lifestyle of healthy everything!!! My greatest win is my positive mindset. Inches gone!!! Happiness gained!!! I am 50 years old & Aging In Reverse!!! I’m a new person this Christmas. My life changed when I joined you. I’m excited for my 1 year anniversary coming up next month. I went from a size 6/medium to a size 2/small. It’s been years since I’ve worn a tight sweater with a pair of jeans!! It’s been years! People! This is a nutrition and lifestyle plan NOT a ‘boring and restrictive diet’. The only thing that works long term is making it a lifestyle! This plan focuses on ADDITION not deprivation. We add in more of the good things and make less room for the bad. The materials and content contained in the 7 Day Jump Start program are for general health information only and are not intended to be a substitute for professional medical advice, diagnosis or treatment. How to get rid of Back of Arm Fat! Say NO to snail mail and save a tree! This is a digital download… nothing is physically MAILED to you. You CAN download to and save on all of your devices, including iPhone/iPad and most other late model smartphones and tablets. This is an instant download you will receive a link to it immediately after purchasing. Download to your computer/tablet/phone. This is a nutrition and lifestyle plan, NOT a workout plan. WHAT IS AT RISK IF YOU DON’T do this!? Look, you don’t have to do this. You can save your $37. AND, 7 days from now you will be in the same spot. You will STILL have weight to lose, you will still be bloated, you still will be low on energy and you still won’t have the confidence you deserve! And the bad news with that? Nothing changes for the better. Deciding NOT to do this doesn’t change a thing. I would LOVE to work with you. It is 7 days that will fly by and change yourself forever! Are you IN?